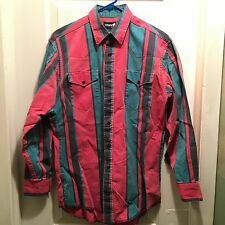 Up for sale is a Vintage 80s/90s Wrangler Shirt with a loud stripe pattern size 15 1/2-33 in used condition, shows minimal signs of wear. Please feel free to inquire with any questions you may have. 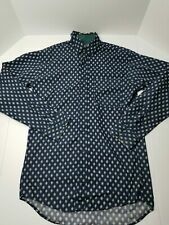 Don't forget to check out other Vintage items I have up. No returns on this item. Thanks for looking! Color ; See Pictures - Multi-Color Plaid. Material; Cotton. Sleeve; 19. Length; 31. Condition; Pre-Owned. Condition;. Color ; See Pictures - Multi-Color Plaid Design. Material; 100% Cotton. I am not able to iron so you may see a wrinkle here and there - still expect for your item to be in great condition when you get it. Armpit to Armpit - 27". Length - 33". 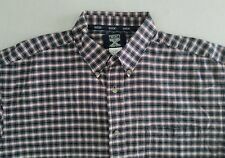 Twenty X Button Down Long Sleeve Multi-Color Dress Shirt 15 1/2-33/34"
Button Down Collar. 100% Cotton. The rest of our zoo does. The shirt is pre-owned, but is in excellent condition. It is lightly starched. This is in good condition. 24 " across chest. before purchasing. 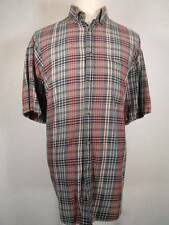 Size: XLarge / 17 1/2" Color: Red Orange Blue Plaid by Wrangler Long Sleeve Button Down Chest Pocket Flat Lay Approximate Measurements: Chest: 26 1/2" (armpit to armpit) Length: 30" (shoulder seam to hem, front) Shoulder: 23" (across back,top, sleeve seam to sleeve seam). The plaid shirt has 3 logo patches sewn on, Ariat, Dodge Rodeo, and Cactus Ropes. The shirt is pre-owned, but still in very good condition. 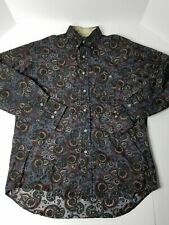 Would look great with a pair of nice jeans. A nice addition to any wardrobe. Tha sleeve length from the cuff to the shoulder seam is 25".